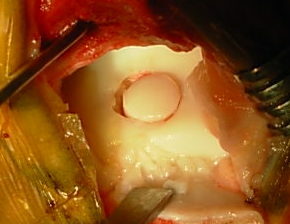 In a joint, the cartilage is anatomically linked to the underlying bone (called subchondral bone). The osteochondritis is a disease of one and/or the other of these two structures. It is more correct to name it talar dome lesion (TDL), because this latest appellation doesn’t assume the cause. A real unity exists between the cartilage and the subchondral bone working together. Thus, the injury of one will have consequences on the other, and an anomaly of one or the other can engender a TDL. The most frequent cause is traumatic. In this case, TDL occurs with the same movement as a lateral ankle sprain: an inversion. Throughout this movement, the talus shifts and its angle comes pushing against the tibia. The TDL is then located in a posterior and medial position. It is often an associated lesion coming with a banal “ankle sprain”. The other classical cause is the authentic osteochondritis. This bone-and-cartilage disease can be located in the ankle but also in the other joints (knee, hip…). Here, there is no history of trauma and no real cause of osteochondritis is found. On the contrary of post-traumatic TDL, osteochondritis is mostly located on the lateral part of the talus, sometimes central. In each case, it is important to understand the long-term evolution of these injuries. The affected talar area is mechanically defaulting. It acts as if it was mechanically excluded from the joint. The same unchanged forces thus apply in the joint. With a constant force but reduced area the intra-articular pressure will increase. The joint wear begins, generating the ankle osteoarthritis over the long term. Most often talar dome lesion remains silent for a long time before the first symptoms appear. Physical activities involving the ankle become painful, especially when standing up weight bearing, and even sometimes in a simple walk. 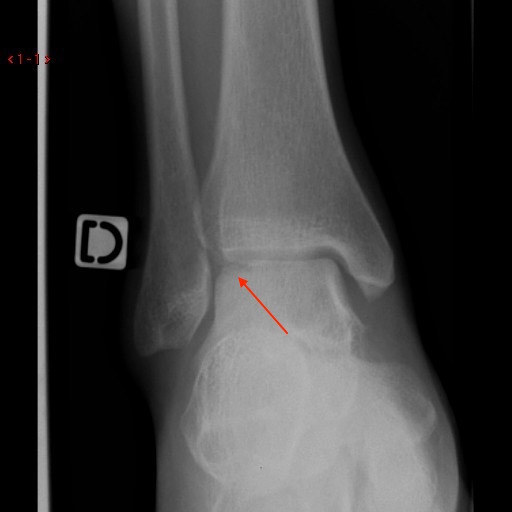 In some cases torn cartilage fragments may come off into the joint space where they act as foreign bodies leading to ankle locking. Sometimes blocking and pain occur in an unusual way: false instabilities. As a reflex to blocking and/or pain the patient feels his ankle getting “loose”as he could feel in an ankle sprain. There is no true instability since the ligaments are intact but the patient feels like he really sprained his ankle. Such a false instability must be clearly identified in order not to go for a ligaments reconstruction surgery which has no chance to help. The surgeon runs a precise clinical exam of the patient’s ankle. He has to move towards a diagnosis and, in parallel, eliminate those that do not seem to correspond to the situation. The most reliable sign of TDL is pain’s reproduction when palpating the ankle. Pressing with the examiner’s finger causes the same pain as usual. Sometimes, the entire joint is painful but most often pain is reproduced when palpating the affected talar area. It is then the best sign of TDL and it’s location. As a beginning regular X-rays are mandatory, even if they are too often and wrongly considered optional. They give informations on the ankle’s architecture and mechanical axes, which is essential in order to define the appropriate treatment options. 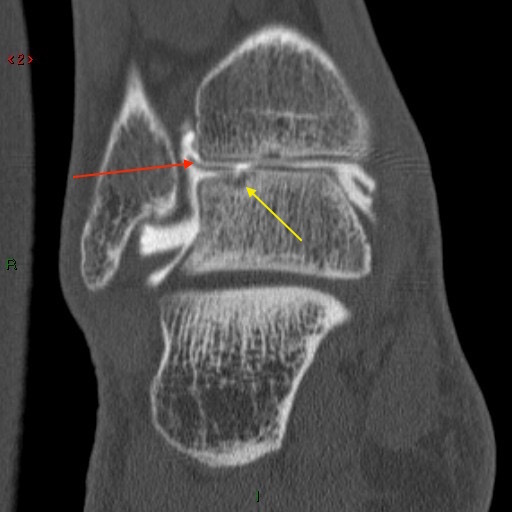 Lateral subchondral bone TDL laying on the lateral edge of the talus and visible on regular X rays. It necessarily traduces a cartilage lesion. An MRI confirms the diagnosis and assesses not only the cartilage but also the subchondral bone. 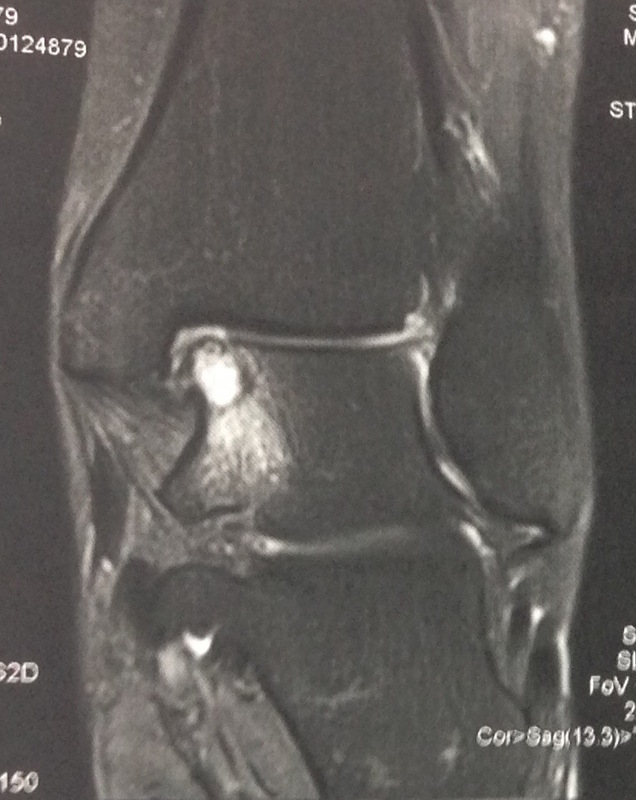 TDL : the MRI highlights a medial lesion of the cartilage and the subchondral bone. However, it isn’t the best exam to analyse the cartilage. An arthro-CT (or arthroscanner) has a much better definition. Before performing a regular CT-scan a liquid is injected into the joint which moulds the cartilage. This exam’s precision is way higher to analyse the cartilage and measure defects, sometimes as small as a millimeter. 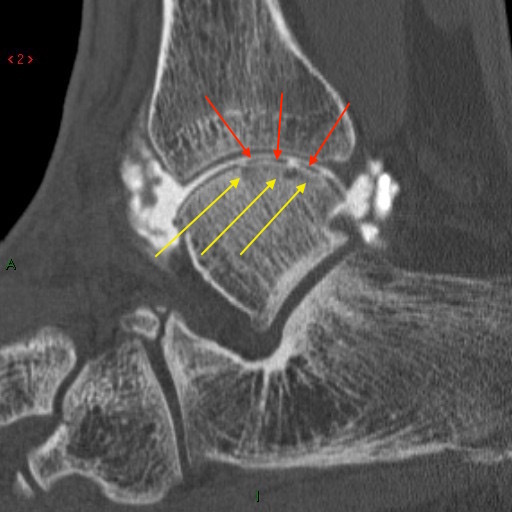 TDL : an arthro-CT highlights cartilage fragments (red arrows) and a subchondral bone injury (yellow arrows). As always, it is fundamental to try all the non-surgical solutions before coming to surgery. It is all the more true as surgical solutions do not aim to stop the pathology’s long term evolution but to limit its manifestations. Stopping sport or adapting the physical activities help to limit (and sometimes remove) pain. It is probably the most difficult recommendation for the patient to accept, above all if he is young and athletic. Nevertheless, he needs to reduce his practices at least temporarily, in order to well understand the link between the physical activity and the symptoms. If pain is relieved, the question of surgery will be asked differently. Shall we opt for an intervention in the only aim to resume sports, which we know is part of worsening the ankle’s function in a long term? Custom-made orthopaedic insoles may contribute to the relief as mechanical forces are reorientated. The heel’s position changes in the shoe and thus talar damaged cartilage saved from weight bearing. Finally, joint injections must be tried. Cortisone derivatives are injected under the control of an X-ray. Their high anti-inflammatory properties may help to reduce pain, even if it’s for sure they won’t remove the TDL. In order to reduce the number of injections they are performed simultaneously with the arthro-CT for which an injection is also needed. Before inquiring about the surgical options, we have to keep in mind that to date no solution is able to achieve an anatomical regression of the TDL. At best is the TDL stopped in its evolution, which is the only aim of the intervention. The main procedure in the treatment of a TDL is the arthroscopic curetage. The arthroscopy is a surgical technique in which the surgeon works through small orifices. He surgeon uses miniaturized instruments under the control of an image captured by a camera inserted trough one of the scars. The TDL is removed up to reaching healthy bone. TDL: Under arthroscopy, the surgeon works through two scars, one for the camera, the other for the instruments. 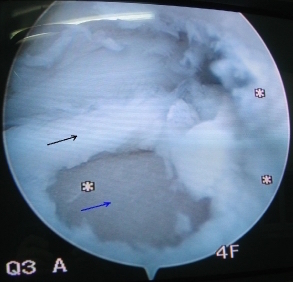 TDL: The arthroscopic exploration visualises the cartilage lesion (black arrow) and the subchondral bone (blue arrow). 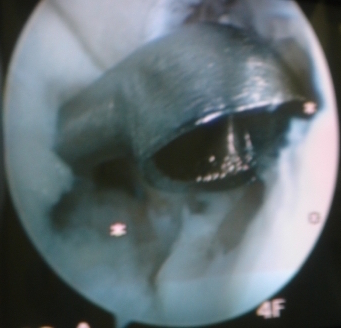 TDL: Arthroscopic curettage of the lesion up to a healthy subchondral bone. This treatment doesn’t consist in restoring a normal anatomy but in removing the TDL which leads to the reconstitution of a healthier bone. As for the cartilage, it’s replaced by a “cartilage-like” scar tissue with different mechanical proprieties. This is why the long-term joint’s degradation still goes on after surgery, event if pain is temporarily relieved. After the intervention, weight bearing is immediately allowed and crutches may be useful for comfort. Resuming usual activities can be planned after 6 weeks postoperative. Another surgical option is called mosaicplasty. 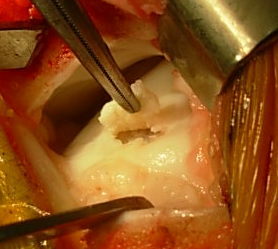 A fragment of bone and cartilage is transferred from the knee to the ankle where the TDL is located. The knee harvesting area is chosen where it won’t be lacking after surgery. 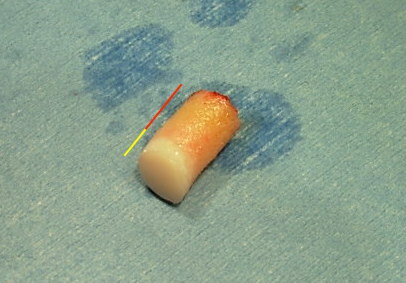 TDL – Mosaicplasty : a drillcore of cartilage (yellow area) and bone (red area) is harvested in the knee. TDL – Mosaicplasty : removal of the TDL before drilling. The talar reveiver area is prepared and the TDL removed. A hole is drilled in the talus and the graft impacted in it to fill it entirely. In large surface TDLs several grafts are needed so that the whole surface is covered. The final aspect looks like a mosaic, hence the name of the technique. 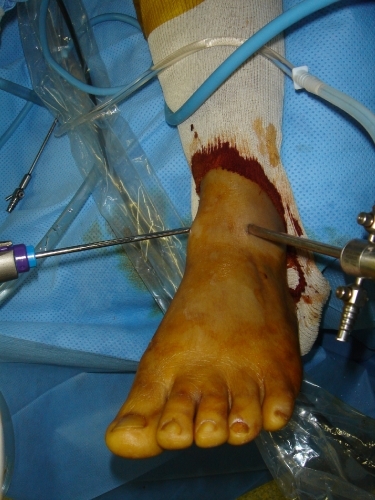 TDL – Mosaicplasty: the bone and cartilage graft is implanted in the talus, in the location of the TDL. Mechanically, the graft is not stabilised by hardware. It’s impacted into the talus, like a nail in a wall. It holds in place since bone is in contact with its entire circumference. Yet, in the most frequent cases, the TDL is located at the edge of the talus, where the bone becomes from horizontal to vertical. A drilling would take away the talar edge and the graft stability would then be compromised. A mosaicplasty is then impossible. This rule also applies in the lateral TDLs. This is the reason why this technique is reserved for TDLs located far from the talar edges. It is the case of authentic osteochondritis lesions, which are often at the center of the talar dome but remain exceptional. After the surgery, no ankle immobilisation is prescribed but weight bearing is forbidden for 6 weeks, the time to graft integration. Despite this reconstruction, the anatomy cannot be considered as back to normal. 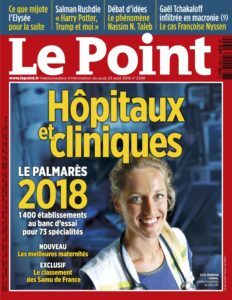 The patient shouldn’t believe in a “magical” surgery. To date no study has proved that the evolution towards arthritis could be stopped.